Sony KDL-40S5500 review | What Hi-Fi? The Sony KDL-40S5500 has a lot going for it, starting with the compact, straight-edged bezel design of the company's more expensive sets. Sure, it lacks the fancy finish of the company's more upmarket 'Z5500, but it remains classily conspicuous. The S-series also does without the slick PS3-style user interface of Sony's pricier models, but the menu system is still clear and easily navigable. Also, because this TV isn't packed with picture-processing modes, calibration's a doddle – and that means you'll be watching a Blu-ray in no time. Let's get this out of the way: this Sony doesn't suffer from the backlight issues that have plagued many of the company's other recent sets. Sure, whites are a little less punchy than on more premium models, but given the price and overall uniformity of the picture, we won't complain. Besides, overall contrast is very good for the money, allowing the bright lights of New York's skyscrapers to stand out vividly against the night sky in the How to Lose Friends and Alienate People Blu-ray. Colours are decent, too – there's a hint of pink to what should be pure whites, and skin tones are just a touch blushy, but the Sony's overall vibrancy is appealing. Detail and sharpness is also close to class standards, and although you don't get any fancy processing here, the 'S5500's motion is impressively smooth for a 50Hz set. Standard-def pictures from DVD are upscaled in stable and detailed fashion, and although Freeview pictures are a bit softer than on some rivals, stability and vibrancy are very decent. All sources are accompanied by sound that's a touch sibilant, but very balanced for a budget LCD. 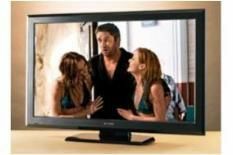 In fact, that's the Sony's story all round: for a budget TV, it's great – it's just that you can get superior performance for not much more money.